A 767 thunders through the sky, racing eastbound towards LAX with a full load of souls in the back happily snacking away on tidbits. The noon sun burns bright, but around Albuquerque, the sky grows dark as night. It is there – at the epicenter of the VLJ universe – that the shadow of a million and one itsy bitsy mini-jets (as the media loves to call them) is blocking out the sun. The sky is thick with these little private airliners, and the 767 must maneuver brilliantly to keep from sucking one of those darned little VLJs into its massive engines. Flying as high as jetliners, though at slower speeds, they [VLJs] have the potential for really gumming up the system. Even 1,000 more vehicles in the system would be a significant new burden. 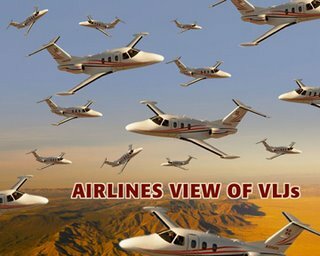 But in this AOPA story, both FAA and industry experts recently told the aviation subcommittee of the Senate Commerce Committee that the ATC system could handle the 5,000 VLJ aircraft that some forecasts say will eventually be added to the fleet. Last week, the Eclipse 500 received full type certification – very good news for the hottest of the VLJ sellers. Other entries from Cessna, Adam, Honda/Piper and Embraer will soon begin appearing regularly on ramps across the U.S., including many of the 5,000 or so smaller airports that the airlines do not serve. So while a few VLJs inbound to Teterboro may clutter the radar screen at the NY TRACON, pilots flying jetliners headed for JFK and LGA are already used to a mess of traffic. Likewise for the airspace around DFW, LAX, SFO, MIA and ORD…a few more targets on the screen won’t cause anyone a moment of grief. And at the other 4,995 or so airports where a VLJ can land, having an inbound Eclipse or Hondajet mix it up with the usual hamburger chasers poking around the patch might just keep all involved a little sharper.